Gorgeous red sandstone adorns much of the West, but arguably, none is as magnificent as that in Sedona, Arizona. Nestled south of the snowy mountains and north of the notoriously scorching Arizona desert, Red Rock Country stretches across wind-whipped mesas, through canyons carved by water millions of years ago and into villages inhabited by Native Americans thousands of years ago. Layered red, yellow, gray and white cliffs 3,000 feet high mark the edges of the canyons, through which sparkling streams tumble and supply sustenance to wildflowers, juniper and pine trees. 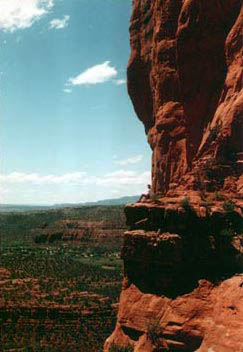 Climbing Cathedral Rock, as the formation at left is called, is not for the faint of heart. But trips abound for hikers of all levels. 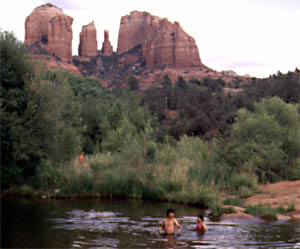 Photo courtesy of HikeSedona.com. Just 25 miles south of Flagstaff along Route 89A, 85 miles southeast of the Grand Canyon and 110 miles north of Phoenix, Sedona is easy to reach, whether you plan to stay for awhile or are simply driving through. Here, the sun shines an average of 350 days of the year. And with its dry air, high altitude (the town is at 4,500 feet above sea level), varying topography and temperate climate, the Sedona area is a haven for outdoor activities. One word of caution if you plan on driving through Sedona without stopping  the area's captivating scenery might just render you unable to leave. Explore Sedona, Ariz., via horseback, foot, mountain bike or jeep in Coconino National Forest, pictured at right. Coconino also offers swimming, fishing and camping opportunities. Photo from U.S. Forest Service. Like most red sandstones across the West, iron oxidation fashioned Sedona's famous face. Now situated at the southern edge of the Colorado Plateau, the Sedona area was an underwater volcanic environment during the Precambrian. The oldest rocks that can be seen are about 1.8 billion years old. The entire history of the area is visible in sedimentary rock layers deposited over millions of years, as the region went from submarine to desert to shallow marine and back to coastal plain and desert over time. Erosion from winds, water, ice and rock falls created the more than 15 separate rock formations, which encompass eight geologic time periods. The terrain varies so drastically, from sheer cliffs to flat mesas (with everything else in between), that there are enough hiking trails to accommodate every type of hiker, from first-timer to mountain climber. And as you drive through the region, every few miles you'll see a trailhead where you can pull over for a hike. Alternatively, you can visit one of the many Internet sites devoted to hiking trails in Arizona before you leave home and print out a trail map. If you plan on hiking though, be sure to bring plenty of water. One of the most popular hiking spots in the region is Oak Creek Canyon, which Oak Creek began eroding around 12 to 15 million years ago and kept going until the canyon reached more than 2,000 feet deep into prehistoric times. No trip to Sedona is complete without at least wandering through the canyon, which you can do at any level of difficulty and time you choose. You won't be disappointed  the lush vegetation, stream bubbling over red rocks and sun shining on the cliffs will leave you with lasting memories. 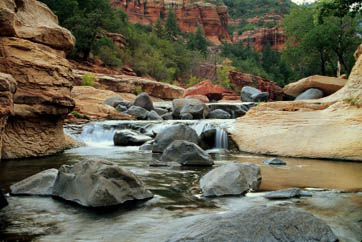 Slide Rock State Park runs right through Oak Creek Canyon, and includes some of the best hiking trails in a region known for its trails. Photo from Arizona State Parks. Mountain biking is also a good option around Sedona, as is horseback riding. Or, for the truly adventurous, try a hot-air balloon tour of the region. As tourism is the core industry in Sedona, many companies offer whatever rental equipment, maps or guided tours you could possibly want. Accommodations abound in the resort towns of Sedona and Oak Creek, although they can be pricey. But if you have the time and money to spend on your vacation, check out one of the renowned bed and breakfasts or spa resorts. Many Sedona visitors also stay in Flagstaff, which is a bit larger than the resort towns. Of course, there are also plenty of campgrounds throughout Coconino National Forest if you prefer roughing it. Wherever you stay, one good way to start your exploration is to rent a jeep; pack your hiking boots, water and gorp, and head out. Whether traveling with friends, family or solitaire, Sedona is an outdoor lovers' paradise. 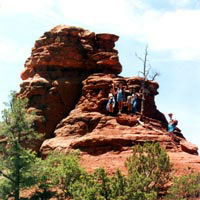 Photo courtesy of HikeSedona.com. And if you want a change of scenery, try one of the many popular golf courses in the area or visit the "healing spas." Myths dating from the first settlers of Sedona  Native American tribes  surround the healing powers of the rock, and visitors flock to the spas to heal body and soul.